In the many years that I’ve known him, I think my friend Michael, the Cornfather’s counterpart in the real world, has ridden in my Honda Civic Hatchback maybe only 4 or 5 times, and only then because he’s had no other options. He calls the hatchback my “toy car,” and another friend, Ric, calls it the “egg.” Yet, despite the ridicule and the fact it has around 300,00 miles on it, I do love it since it’s fun to drive (it’s a 5 speed manual), gets great gas mileage, and I paid it off years ago. And yes, although he doesn’t have quite the same level of difficulty as the Cornfather, Michael does have problems getting in and out of the thing. when the strip first started, those symbols used to be on the front of jefbot’s shirt, and the “negative space” 6 was on the back, but i switched them probably around the 3rd or 4th strip, and went back and changed the art to keep it consistent. i rarely draw jefbot from the back, so those symbols haven’t been seen in a while. and as far as that background image is concerned: i drew the strip originally with the camera pulled out so you could see the whole car, but then decided to zoom in a bit when placing the panel in the frame. before the zoom, the bg looked like an apartment building instead of an abstract painting of the sea floor. 🙂 thanks for the great comment, Spanky! yes, i agree, Sonitan – the Cornfather’s “butter” idea is not the most practical solution. heheh. 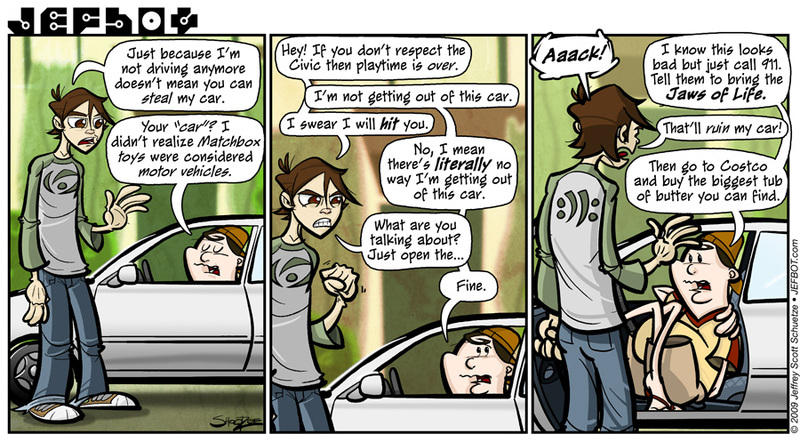 I have this problem with tiny cars! Only ’cause I’m 5’8 though. My legs get stuck! i’m only comfortable in small cars, Shan! i freak out whenever i have to drive something bigger than my civic. Working my way through the archive and just had to agree with this one. My first car was a white Civic 1300 hatchback. All my cars since then have been small as well. My driver’s license says I am 5’10” and have always had plenty of room. Riding in my friend’s full size pickup feels downright unnatural; too..much..space! That is REALLY funny!!! The delivery is so good and I love the reactions!!!!!!!!! thanks, Jeff! glad you liked it. I’m with Spanky, i don’t remember the symbols on back. And I was thinking… wouldn’t this be the PERFECT time to get revenge on the Cornfather for his insults against the land of the Rising Sun? true that, eleventeen – jefbot should just leave the Cornfather to chew off an arm or leg if he wants to escape. but then jefbot would have to clean up the mess, of course. Wow bot, you created a new type of comedy here: Car Humour. I love that your car is in it. And that is exactly how I look in your car, too. 😉 Really funny expressions and even funnier contortions. The dialogue is great, yet again. I really like the “tub of butter” but I still think vaseline is the best “tool” for the job. Great work, man. Really great. thanks Michael, but this strip just continues the great tradition of car humor set forth by such classics as My Mother the Car, Herbie the Love Bug, and of course, DC Cab. thanks, Foxmouse! i don’t think the Cornfather knew just how flexible he was, either. You know, I just thought of something… if Michael considers Jef’s car a “matchbox toy”… why in the world he got inside to beging with?!!! i love ur strip, thats kinda like me getting in little cars too, i may only be 5’5”, but ive got long legs! thats exactly how i feel a lot. So, Kevin, you like eating KY Jelly? Cornfather is going to have to rely on his vast clown experience to get out of that car! heheh. somehow, i don’t think he mastered that skill, John. ha! i’m telling your wife, Kbed. I giggled so hard! Love it keep up the excellent work! That is outstanding! I love that… get the Jaws of Life!!! LOL! As always, brilliant work Jefbot!!! I can totally sympathize with Cornfather here. I had a Corolla a while back and it was a pain for me to get in and out of that sucker. i drove a corolla before i got the civic, Eptha. i loved that car, too, but yeah, it was even smaller than the honda. thanks for the lurv, Nat! I love mad Jefbot and these new poses. Great dialogue, too! glad you like “pretzel Cornfather,” Lor! Too funny – the Cornfather rules!! Ack! Michael covered in butter! Get it out of my head! Wait… “300,00”? Either your car is 4D or that’s a typo. And it’s not the former. How many really? Years ago, I had one of the first Honda autos to be brought into the US. 600cc air cooled twin cylinder (there was a 360 that was Japan only – something about insurance laws there). The car was [i]tiny[/i] – about the same as the original MiniCoopers or maybe a bit smaller. The engine was up where you’d expect the radiator to be. I’m 6’1″, and had no problems getting in or out. Dont worry jefbot im comin! Just let me hop in 606 and drive 2000 miles. I’ll be there as soon as I get approval from the chief… Then i’ll have your car opened up in no time! …it may be a convertible when im done, but hey, convertibles are cool, right?